"Dissidents" are people who actively challenge established doctrine, policy, or institutions. This post is the eighth in a series of 10 posts regarding the confusing "revolutions" of the 2016 Presidential Election. Shareholder Capitalists and Academic Oligarchists together make up a group all others can despise called "The Establishment." Shareholder Capitalists manipulate our economy and Academic Oligarchists control key facets of our national government including monetary policy. In the middle of those conflicts are Congress and state legislatures led by people who are normally not automatic members of the Academic Oligarchy nor true Shareholder Capitalists. The conflicts traditionally have been fought within the framework of political parties, elections, and legislative bodies that rely upon negotiations and compromise. But, as previously discussed, during the past 30 years within the United States some wealthy Shareholder Capitalists, having become a subgroup of dissidents themselves, using the State Policy Network have successfully bypassed the norms of the process by investing large sums of money in Congressional and legislative candidates and in the news media.The Koch brothers are the best known example. This is not unusual in the U.S. Henry Ford was probably the most notorious because of his active support of the rise of Hitler. "I regard Henry Ford as my inspiration," said Adolph Hitler in 1931. It is the extreme extension of the corporate view that people are unimportant. This change has allowed Shareholder Capitalists to operate with far fewer restrictions from Academic Oligarchists. During the past 30 years, many Academic Oligarchists have become complacent permitting the undoing of changes made earlier in the 20th Century to avoid an Authoritarian Revolution. In the process, they've allowed the word compromise to become despised. The fact that an effective democratic republic can only work if the players can find a middle ground on complicated issues is lost, or that fact specifically has been suppressed. You only had to look at the candidates in this year's primary (or in the Brexit vote) to find examples of Romantic Populist and the Mythical Reactionary movements opposing the developments of the past 30 years. to provide and protect transportation infrastructure such as roads, ports, and airports. To accomplish corporate goals successful Shareholder Capitalists don't hold political office as their power is found in corporate environment based upon a lifetime of focus on work. Academic Oligarchists assure this framework for them, arguing only over the details based upon perceived impacts of monetary policy on the rest of us. Without the reasonable support of Congress and the state legislatures along with the concurrence of the majority of the Supreme Court, Academic Oligarchists are at a major disadvantage. Unless of course they use military force in an Authoritarian Revolution. A true peaceful total revolution by populists or reactionaries is a mythical, romantic fantasy which is exactly what our founding fathers intended. Some peaceful policy successes by Romantic Populists and Mythical Reactionaries have been accomplished. Within the American Congress and the state legislatures, both Romantic Populists and Mythical Reactionaries occasionally win some policy battles through legislation. As a group neither Academic Oligarchists nor Shareholder Capitalists embrace a particular "ideology". Neither is rigidly "left" or "right", "liberal" or "conservative" because those labels have no real world meaning beyond political spin. Most understand that if you get caught up in an ideological myth, you are inside a bubble that prevents your meaningful participation in the world. They let the rest of us argue over ideology. Let's take a look at some examples of issues of concern to 21st Century Americans because they have contributed to the Economic Collapse and which Academic Oligarchists and Shareholder Capitalists have struggled with. That 2016 housing costs are the source of voter anger in the U.S. is a no brainer. Perhaps the only domestic issue George Bush and Bill Clinton were in complete agreement about was maximizing home ownership, each trying to lay claim to a record percentage of homeowners, and both describing their efforts as a boon to blacks and Hispanics. HUD, Fannie, and Freddie were their instruments, and, as is now apparent, the more unsavory the means, the greater the growth. But, as Paul Krugman noted in the Times recently, "homeownership isn't for everyone," adding that as many as 10 million of the new buyers are stuck now with negative home equity—meaning that with falling house prices, their mortgages exceed the value of their homes. So many others have gone through foreclosure that there's been a net loss in home ownership since 1998. Ohio foreclosures are at crisis levels, with more than 70,000 new foreclosures filed in 2012. This was about the same as in 2011 when the state experienced 71,556 foreclosures. What began as mostly an urban problem in the mid-1990s later erupted into a statewide epidemic. Levels have been, for the past three years, below the peak level of 89,000 in 2009. Despite these recent declines, last year’s rates were still two times higher than they had been a decade before in every Ohio county. The high foreclosure numbers persist despite national, state, and local efforts to stem new filings. Foreclosures represent a major and ongoing blow against families’ main source of savings and against stability. This report analyzes the new foreclosure filings statistics in Ohio along with some of the latest developments in foreclosure prevention efforts. To add context to the foreclosure numbers, the report provides updates on mortgage defaults and negative equity. It ends with recommendations to better assist individuals, families and communities in becoming more stable. Even as home prices continue to recover from the last decade's housing collapse, there's another crisis developing: sky-high rent burdens. About 11.4 million American households are paying more than half of their incomes to afford their rent, a record high, according to a new report from Harvard's Joint Center for Housing Studies. Rent burdens are especially widespread in moderate-income households in the 10 most expensive housing markets, where the report notes that three-quarters of renters earning less than $45,000 pay more than 30 percent of their income on housing. Younger Americans are also struggling with a decline in real incomes, with 25 to 34 year olds coping with an 18 percent slump in real incomes, which has added to the difficulties of saving for a down payment. With homeownership declining, the rental market is where the housing market is shining. More than 36 percent of U.S. households were renters last year, the highest share in five decades. "Rental demand has risen across all age groups, income levels, and household types, with large increases among older renters and families with children," the report noted. That's also prompted a rise in households who are cost-burdened, or paying more than 30 percent of their incomes to their landlords. About 21.3 million American households are now considered cost-burdened, an increase of 3.6 million from 2008. The anger of many Mythical Reactionaries supporting Trump begins with the disappointment brought about by George Bush and Bill Clinton advocating maximizing home ownership (part of the ownership society Bush talked about which dates back to Margaret Thatcher's administration in the United Kingdom). On Monday, New York City took a dramatic step that highlights just how out of control rental housing costs have become in the Big Apple and in many cities nationwide. For the first time, New York froze rents for one-year leases on a million rent-stabilized apartments. Landlords balked and criticized City Hall, calling the move an “unconscionable, politically driven decision.” But Rent Board chair Rachel Godsil was having none of it. Her staff had found that landlord incomes had grown for nine years in a row, including by 3.4 percent last year, while costs only grew by 0.5 percent. In contrast, a majority of most stabilized renters faced continuing income stagnation. Some, but not all, landlords are Shareholder Capitalists and this is an example of conflict with Academic Oligarchists. But the fact is that in many regions, particularly in California, Academic Oligarchists have supported policies that create housing shortages. The reasons are complex and include popular environmental rationales. They rationales are, of course, part of a sales pitch hiding economic impacts by diverting attention, much like gay marriage as an issue diverts attention. We advise the Legislature to change policies to facilitate significantly more private home and apartment building in California’s coastal urban areas. Though the exact number of new housing units California needs to build is uncertain, the general magnitude is enormous. On top of the 100,000 to 140,000 housing units California is expected to build each year, the state probably would have to build as many as 100,000 additional units annually—almost exclusively in its coastal communities—to seriously mitigate its problems with housing affordability. Facilitating additional housing of this magnitude will be extremely difficult. It could place strains on the state’s infrastructure and natural resources and alter the prized character of California’s coastal communities. It also would require the state to make changes to a broad range of policies that affect housing supply directly or indirectly—including policies that have been fundamental tenets of California government for many years. Those "fundamental tenets" - mostly environmentalism - curiously had the side effect of creating a housing shortage inflating the value of existing homes to the benefit of homeowners who then also apply additional pressure on California's Academic Oligarchists. To date no possible compromise has been achieved, though the recent termination of the Executive Director of the California Coastal Commission, Academic Oligarchist Charles Lester (Columbia), was attributed in part to pressure from "some of the state's most powerful lobbyists, representing some of the state's wealthiest people and corporations" or Shareholder Capitalists. U.S. Government-backed student loans were first offered in the 1950s under the National Defense Education Act (NDEA), and were only available to select categories of students, such as those studying toward engineering, science, or education degrees. The student loan program, along with other parts of the Act, which subsidized college professor training, was established in response to the Soviet Union's launch of the Sputnik satellite, and a widespread perception that the United States was falling behind in science and technology, in the middle of the Cold War. Student loans were extended more broadly in the 1960s under the Higher Education Act of 1965, with the goal of encouraging greater social mobility and equality of opportunity. In 1987, President Ronald Reagan's Secretary of Education William Bennett raised the issue underlying expanding student debt in a New York Times Opinion Piece titled Our Greedy Colleges. A Harvard Law graduate and automatic Academic Oligarchist, Bennett is ignored by the public and considered a conservative by those who like to use meaningless labels. At the time Bennett wrote his opinion piece the Reagan Administration was trying to minimize the future impact of the student debt problem by creating Income Contingent Loans which would permit repayment schedules to be tailored to a student's income. As Bennett explained it in the context of a time when graduates would likely get good jobs: "A graduate's payments would never have to exceed 15 percent of his adjusted gross income, and he could have as long as necessary to repay." Many of our colleges are at it again. As they have done annually for the past six years, they have begun to unveil tuition increases that far outstrip the inflation rate. Next year, tuition is expected to rise 6 percent to 8 percent - even though inflation during 1986 was about 1.8 percent. At the same time that higher education has been cutting a bigger piece of the Federal pie, it has also received huge infusions of cash from state governments, from corporations, from foundations and from loyal alumni. The total increase in higher education spending from all these non-Federal sources is staggering. Spending for higher education now consumes about 40 percent of all money spent in America for education. It is by no means clear that the performance of many of our colleges and universities justifies this level of expenditure. As I said on the occasion of Harvard's 350th anniversary, too many students fail to receive the education they deserve at our nation's universities. The real problem is not lack of money but failure of vision. While Bennett and other members of the Reagan Administration in the context of the time attempted to make the impact of the student loan program less onerous, Bennett was attempting to get future Academic Oligarchists and Congress to deal with the underlying problem - greedy colleges and universities which he felt were not offering a good product and were beginning to look a lot like institutions operated by Shareholder Capitalists. It is more than ironic that by the 21st Century Shareholder Capitalists, including Donald Trump, were actually running colleges for profit. And, of course, by the 21st Century students from all types of colleges and universities were saddled with high debt while the number of employment opportunities for new graduates that were typical from 1950-1990 declined. 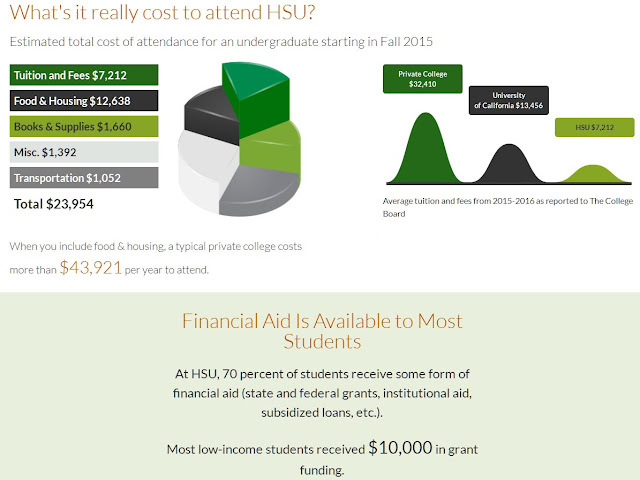 When I say that the "free tuition" for everyone as being presented is a delusional solution, it is because as you can see from this website without tuition a four year program still would cost about $80,000.Having the government fund tuition at California's state colleges would cover an additional $20,000. Sure, it would help to have free tuition. But it wouldn't come close to keeping students out of debt. That the Sanders Romantic Populists aren't well enough informed to understand this reinforces William Bennett's comment: "It is by no means clear that the performance of many of our colleges and universities justifies this level of expenditure." Still, the Shareholder Capitalists and Academic Oligarchists together have failed to devise a compromise to minimize this debt problem. Further, the Shareholder Capitalists - particularly the tech sector innovators - are the ones demanding this additional education/training. Many have been hiring immigrants from Asia rather than funding adequate education. This has resulted in the political backlash from both Romantic Populists saddled with the debt and Mythical Reactionaries objecting to immigration. It is still possible for the Academic Oligarchists to devise solutions to problems even with resistance from Shareholder Capitalists, particularly when the latter group is divided on an issue. No one thought about the internet in ideological terms when it was being developed in the framework of the Department of Defense and cooperating universities - both stable institutional environments mostly controlled by Academic Oligarchists. Then the internet was broadly implemented by Shareholder Capitalists in the late 1980s and early 1990s. Following broad implementation, however, America was confronted with a populist uprising over net neutrality with Shareholder Capitalists disagreeing with each other because of contrary interest - internet service providers versus web site operators. In this case Academic Oligarchists devised the adaptation. Academic Oligarchists this past year set some operational rules within a framework of encouraging the profitable consolidation of internet service providers by Shareholder Capitalists and the profitable operation of popular web sites by new Shareholder Capitalists. It also assures a mix of Shareholder Capitalist beneficiaries such as cloud service providers ranging from the venerable IBM to Jeff Bezos' Amazon. This is a good example of adaptation by Academic Oligarchists and Shareholder Capitalists. But it is also an example of how what is a public utility - in terms of a historical understanding of that term - typically heavily regulated to achieve egalitarian economic goals, can become something else just by administrative actions of Academic Oligarchists. It was necessary because of gridlock in Congress. The rules will avoid any continuing threat of revolution from tech Romantic Populists, who were focused not on rates charged to American families, but on making sure the entertainment website corporations didn't get reduced speeds or have to pay "fast lane" charges to the internet service corporations. The issue of net neutrality appears to have been resolved by a policy decision from a government bureaucracy - the Federal Communications Commission (FCC). In the process, two automatic Academic Oligarchists - Jessica Rosenworcel, Wellesley, for neutrality regulation (see How Jessica Rosenworcel Is Shaping Our Digital Future) and Ajit Pai, Harvard and University of Chicago, against neutrality regulation (see - Net neutrality's chief critic) - played key roles in the debate. The net neutrality policy approved by a 3-2 Commission vote orders what tech nerd Romantic Populists believe is beneficial true net neutrality. (The policy might be reviewed by the Supreme Court though they may pass on taking up the appeal of the appeals court decision approving the new policy written by Appellate Court Judges Sri Srinivasan, Stanford, and David Tatel, University of Chicago.) Within this discussion, the FCC has assured all Shareholder Capitalists that it will not get involved in their routine setting of rates for internet activity. The sad fact is, of the three examples, the first two matter in people's lives but the Academic Oligarchists failed miserably. Even Net Neutrality will not assure internet affordability nor universal high speed internet for ordinary folks. In 2016 it appears we have reached a point that the Academic Oligarchists and Shareholder Capitalists may face a serious revolution.